H.K. Bedford, 149 ft., built 1885. From Fred Way's Packet Directory: Capt. Gordon C. Greene bought her in approximately 1890 to "enter the Pittsburgh - Wheeling trade, the beginning of Greene Line Steamers, Inc. . . . As a postscript, in October 1987 under charter to the Louisville & Cincinnati Packet Co., she ran the L&C trade with Capt. Mary B. Greene, master -- first time a woman had been in charge of an L&C packet. Neva, 117 ft., built 1898. From Fred Way's Packet Directory: "Sold Sept. 24, 1904, to Capt. Mary B. Greene and C.F. Stalder . . ."
Argand, 132.6 ft., built 1896 for Capts. Newt Flesher and Gordon C. Greene. Capt. Mary B. Greene was Master. Boat sold and later in 1927 burned in Lowell, Ohio on the Muskingum River. From Fred Way's Packet Directory: "The boiler was still there in the mud late as 1949." Greenland, 210 ft., built 1903 for Capt. Gordon C. Greene. Mary B. Greene commanded on occasion. Gordon C. Greene, built in 1923. From Fred Way: "It was the family boat with Capt. Tom R. Greene in command, his mother [Mary Greene] usually aboard, his wife Letha and family frequently . . . A bar was provided on the main deck (called "Uncle Tom's Cabin") but no liquor sold. The atmosphere on board was pleasant and healthy, the operation eminently successful in a financial way, and Cap'n Tom and his mother were generous with invitations to "river fans" who rode as guests from here to there, a floating convention center. Hence many youngsters who worked aboard, or who rode for free, grew up better for the experience and opportunity. There was never anything quite like this on the rivers. When the Delta Queen arrived on the scene, the Gordon was put in the St. Louis - St. Paul trade . . ."
Buy a copy of Fred Way's Packet Directory to learn more river history. A new story about a passenger's encounter with Mary Greene is posted at the Delta Queen remembrance page, see: "My Mother Reprimands a Ghost." My great-grandmother was Cecelia Greene.... She mentioned being related to the Delta Queen Greenes. This site is a pretty good site, but I was looking for information on Mary Green, the ghost of the Delta Queen. Please, I need some information on Mary Green. Also, there was an episode of Unsolved Mysteries about a woman who believed she was in the Greene family in a past life, but that she killed herself in the river when she found out she was pregnant out of wedlock. Delta Queen Steamboat Captain Gabe Chengery probably tells these stories better than me. I wonder why Mary Greene "visits" the Delta Queen. Don't you? I can't find any information on the internet about Mary Greene. Do you own the Delta Queen? Well, I have to go. Write back! We need to build a page for Mary Greene. Tell me all the info you've gathered & I'll put it on a page called marygreene.html. Then the internet will have something about her. Do you have a photo of her? My dad's company owned the Delta Queen from 1958-1976. My dad's boss bought 51% of the stock from Letha Greene, mary Greene's daughter-in-law & heir, in order to save the company from bankruptcy in 1958. I don't have a picture of her, but I've seen one on a movie!!! It was a history channel movie, so maybe there's a picture of her on there. I only know as much as you know about her, but maybe we can write to that person who signed your guestbook. I saw on the movie that she always appears after midnight, there isn't a specific time. I wonder why. Well, I have to go! Write back! If you go on the Delta Queen you will see that the whole boat is saturated with her presence. 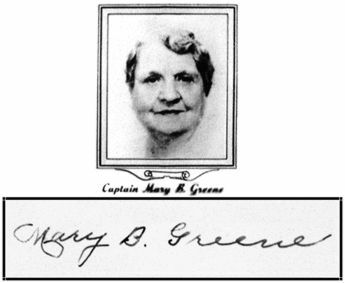 Mary B. Greene played an important role in the Delta Queen's history. 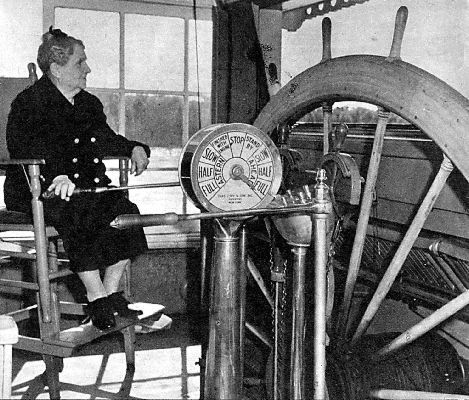 She was one of the founders of the Delta Queen Steamboat Company as well as the first female ship captain. She loved the Queen and took excellent care of her. Ma Greene, as she was known as, worked to keep the ship family friendly and definitely did not approve of the sale of alcohol. She didn't allow a drop of it on her ship. In 1949, Ma Greene passed away. Most employees tried to adhere to her wishes. However, a group decided to set up a saloon on the Queen. Minutes after the first cocktail was served, A barge wrecked in to the ship, completely destroying the saloon. Ironically, the barge was called Captain Mary B, named after Ma Greene. Many associate this accident as Greene's displeasure with the saloon. An apparition of a lady believed to be Ma Greene has been seen wandering the steamboat. Many say she is friendly but remains to keep a close eye on her beloved Delta Queen. Photos supplied by Dave Thomson.